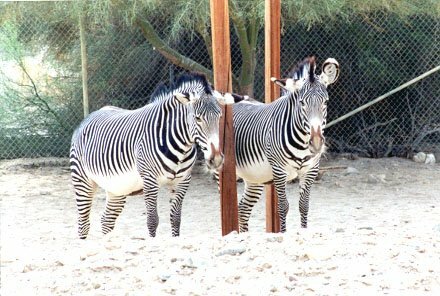 Grevy's zebra weighs 350 - 450 kg (770 - 990 lb). It lives in arid, open bushed grassland and is adapted to survive droughts, as long as it can reach water every several days. Grasses make up about 70% of the Grevy's zebra's diet. It also browses on shrubs and trees. The Grevy's zebra has an open society in which females with their young and males on established territories are the focal points. There are no permanent bonds between adults. They are solitary or live in a variety of different associations that usually do not last longer than a few months. Some stallions are territorial, with territories of up to 12 sq km (4.6 sq mi). The resident stallion tolerates other stallions in his territory, but they do not interfere with the resident stallion when he is mating. The Grevy's zebra formerly occurred from central Ethiopia to Somalia and northern Kenya. It experienced a significant decline in the 1970's, apparently due to poaching to obtain the zebra's attractive hide for fashion. It is now found only in northeastern Ethiopia and some reserves in Kenya. Poaching of Grevy's zebra is no longer a threat, due to protection under CITES. Loss of grazing habitat and access to water, due to competition with increasing herds of domestic livestock, is the primary threat to the Grevy's zebra. Additional threats are due to reduced river flow, due to irrigation, and uncontrolled tourism in reserves, which causes disturbance and destruction of vegetation. *** A young Grevy's zebra can walk within a half hour of birth and can run for short distances within 45 minutes of birth. *** The Grevy's zebra is the largest of the wild equids. In the past, the Grevy's zebra was found in the Awash Valley, the Ogaden region, and northeast of Lake Turkana in Ethiopia, south into Kenya east of the Rift Valley and Lake Turkana, north of Mount Kenya and the Tana River, and east into western Somalia. It apparently experienced a significant decline in the 1970's. In the late 1980's it occurred in three isolated populations: Kenya, north of the Tana River; Ethiopia, on the east side of Omo River to Lake Zwai, and Somalia. It has not been seen in Somalia since 1973 and is presumed to be extinct there. It is now restricted to Ethiopia and Kenya, and possibly Sudan. Poaching of Grevy's zebra skins for use in fashion was a major problem during the 1970's, especially until 1976, when Kenya passed protection laws. Poaching is no longer a threat, due to protection under CITES. Loss of grazing habitat and access to water, due to competition with increasing herds of domestic livestock, is the primary threat to the Grevy's zebra. In addition, reduced river flow, due to irrigation, has decreased the availability of surface water in parts of its Kenyan range. In reserves, another threat results from uncontrolled tourism, which causes disturbance and destruction of vegetation. The female Grevy's zebra weighs 350 - 400 kg (avg 385 kg) (770 - 880 lb (avg 847 lb)); males weigh 380 - 450 kg (avg 430 kg) (836 - 990 lb (avg 950 lb)). Grevy's zebra lives in semi-arid bush/grass mosaics with a preference for tracts of grassland growing on deep sand, hard-pans, sumplands and in areas where fire and elephants have degraded the dominant Acacia/Commiphora woodlands. (Kingdon 1997) It is able to live in deserts if there is permanent water within reach every 2 - 5 days (for lactating mares 1 - 2 days) (van Dierendonck & de Vries 1996) . Close to 6 years (wild); 3 - 5 years (captivity). Usually August or September, but mating and births can occur all during the year. A mare usually bears 1 young at a time. There are usually 2 years between births. Young are generally weaned at about 8 - 13 months of age. Up to 18 years in the wild. Grasses make up about 70% of the Grevy's zebra's diet. It also browses on shrubs and trees. Female Grevy's zebras return to localized birthing areas that appear to be traditional. The Grevy's zebra has an open society in which females with their young and males on established territories are the focal points. There are no permanent bonds between adults. Females associate in nursing groups, males in bachelor groups and all classes may join up in large, mixed herds, with none of these groupings lasting longer than a few months. Aggression is infrequent except that territorial males assert their mating prerogatives. A solitary breeding stallion maintains a large territory and associates with mares only when they enter his territory. The most successful males win grassy territories close to water. Grass and water are major attractions, especially for lactating females. Some stallions are territorial. The territories are large for a herbivore: 2.7 - 10.5 sq km (1 - 4 sq mi) in northern Kenya (Nowak & Paradiso 1983) . The territories of the breeding males are the largest that have been found in any ungulate (Duncan 1992) . Individual long-term ranges of both females and males can cover up to 10,000 sq km (4000 sq mi) (Duncan 1992) . Males have territories of up to 12 sq km (4.6 sq mi) (Kingdon 1997).